Erickson glass was made in Bremen, Ohio, from 1943 to 1961. Carl and Steven Erickson designed and made free-blown and mold-blown glass. Erickson made solid-colored glass with hand-tooled shapes and decorations similar to Scandinavian and Italian designs. 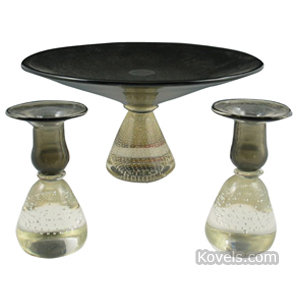 Best known are pieces with heavy ball-shaped bases filled with controlled bubbles.